Less than a month after filing for divorce, the estranged wife of David Hasselhoff has filed for a court order on a claim of domestic violence by the former "Baywatch" star, according to court records. Actress Pamela Bach, 42, made the filing Monday against Hasselhoff, 53, in Los Angeles Superior Court, summary records on the court's Web site show. "The court indicated that she should stay where she is, and he should stay where he is," Hasselhoff's attorney, Melvin Goldsman said by phone Wednesday, declining to comment on the allegations. Bach was granted custody of one daughter while Hasselhoff was given custody of the other, publicist Judy Katz said Wednesday. 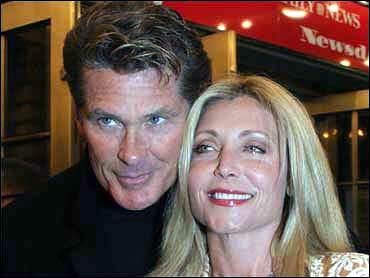 Hasselhoff filed for divorce Jan. 12, citing irreconcilable differences after 16 years of marriage. Bach filed her own divorce papers a day later, also citing irreconcilable differences. Hasselhoff played lifeguard Mitch Buchannon in "Baywatch" from 1989 to 2000. He also starred in the 1980s TV series "Knight Rider," in which his character, Michael Knight, teamed with a talking Pontiac Trans Am sports car to fight crime. Bach appeared in the soap opera "The Young and the Restless" and in numerous episodes of "Baywatch" and "Knight Rider."